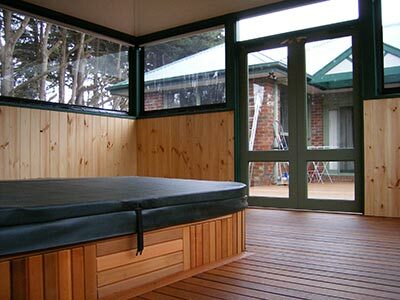 How can you have an outside spa that can comfortably be used for 365 days of the year, while still maintaining strict Council regulations? That was the question posed by the homeowners at this property in Somerville, on Victoria’s Mornington Peninsula. They wanted a spa room that would be closed in the cooler months and open in the warmer months, to enjoy the best of both worlds. The answer, developed by Phillip Cassar from Outside Concepts’ Mornington Branch, is part spa room, part patio and 100% inspiration! He’s designed and built a free-standing patio to cover the spa and then installed blinds that can be rolled up when the homeowners want to enjoy being outside. Importantly, the patio fully encloses the spa all-year-round and can only be accessed by adults, to ensure the spa meets Council regulations and to prevent children accessing the spa unsupervised. Additional features include a beautiful hardwood deck lining the spa room and the path from the spa room to the back of the house, a pine-lined interior, a ceiling lined with cement sheeting and trims to match the house. The result is a truly beautiful spa room and decking that the homeowners can comfortably and safety use, 365 days of the year.